Mature horses have a heart rate between 35 to 45 beats per minute (bpm) at rest, while a two-year-old will have a slightly faster pulse. Young foals, two to four weeks of age, usually have a pulse of 70 to 90 bpm. Learning to take your horse's pulse is a basic and important horse owner skill. Exercise, physical condition, environmental temperature, disease, excitement, and age can influence a horse's heart rate. Pulse rates of more than 80 bpm, in the absence of excitement or exercise, may indicate severe dehydration, colic, shock, infection, advanced heart and lung disease, or septicemia. Call your veterinarian! A pulse rate under 20 bpm suggests low body temperature, heart disease, pressure on the brain, or a possible preterminal state with an impending collapse of circulation. The pulse, which reflects the heart rate, can be taken at any point where a large artery is located just beneath the skin. Sounds easy doesn't it? Actually, finding and determining a horse's pulse can be difficult, even for professionals. It takes just the right touch and plenty of practice. Fortunately, most peoplee can learn to use a stethoscope to hear the heart beat with practice. The maxillary artery supplies blood to the horse's face. This pulse point is relatively easy to feel. Stand slightly to the side of the horse's head and cup your hand with your first two fingers along the inside of the jawbone, just below the heavy muscles of the cheek. Feel along the inside of the jawbone until you consistently feel the pulse beat. Looking at your watch, count the beats for 30 seconds, then double the count to give you bpm. Anatomically, the horse's knee is equivalent to the human wrist. The radial pulse is a common human pulse point. We found finding the pulse here to be difficult. © 2012 EquiMed LLCNew window. Crouch facing the limb, then place your hand around the back of the knee with the pads of your fingers pressing on the radial artery. Taking the pulse here is similar to taking your pulse at the wrist. Once your fingers locate the strong, consistent pulse beat, count the beats for 30 seconds and double the count for the bpm. The digital artery pulse becomes pronounced when there is a lameness or pain in the foot. Crouch facing the limb and locate the digital artery with the pads of your fingers. The pulse may be best found on the inside or outside branch of the digital artery. On this horse, the pulse was more easily felt on the outside branch. Place the pads of your fingers on the artery and count the beats for 30 seconds, then double for bpm. 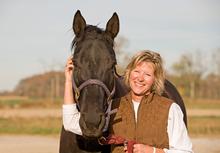 Taking a horse's pulse can be very difficult, even for an experienced veterinarian. The horse pulse is rather slow, and finding just the right spot to feel the pulse, especially on a moving animal, will test your patience. The veterinarian preferred method of getting your horse's heart rate is by using a stethoscope. A simpler method to get your horse's heart rate is to listen with a stethoscope. For most people, including most veterinarians, this is the preferred method. You can purchase a quality stethoscope for under $100. 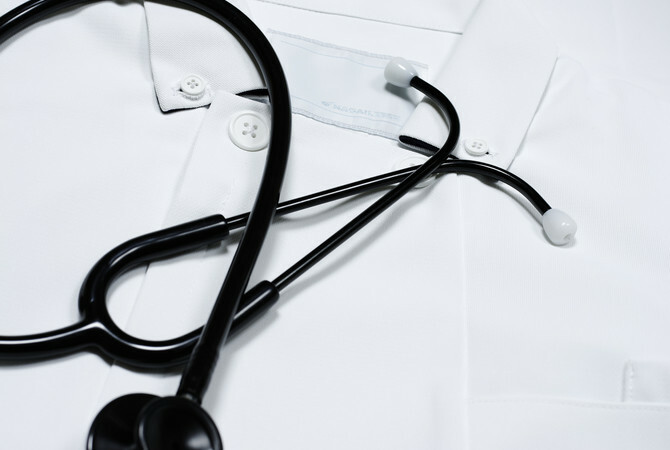 Our favorite is the Littmann Classic, used by medical professionals. Properly place the stethoscope ear tips in your ears. Note that the ear tips should be pointing forward for the proper and comfortable placement. Position yourself on the left side (mounting side) of the horse, at the front shoulder, facing to the rear of the animal. 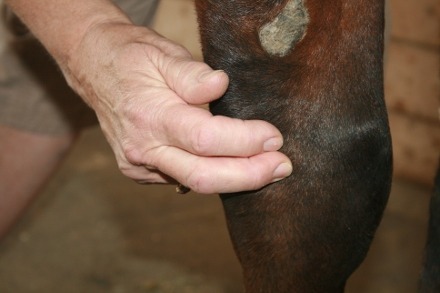 Locate the elbow of the horse and place the diaphragm just behind the elbow on the chest wall. Press moderately and listing for a low dub-dub sound. When you can clearly hear the sound, count each dub-dub for 30 seconds, then double for the bpm. Your horse's pulse should be strong, steady, and regular. Knowing your horse's regular pulse rate is helpful in determining the state of your horse's health in cases of illness or injury. Equine vital signs are relatively easy to take, and can provide your veterinarian with information that may help diagnose a disease or condition in your horse.